There’s nothing funny about making sausages, nothing at all. 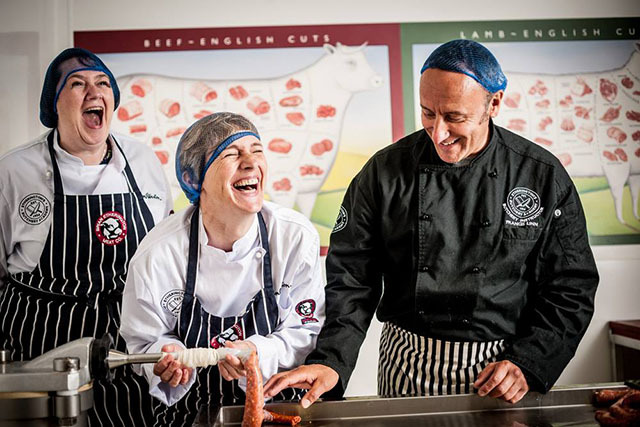 If you’re serious about snags, bonkers about bangers or passionate about pork, then sign up to one of these brilliant butchery courses in Cornwall and the South West. 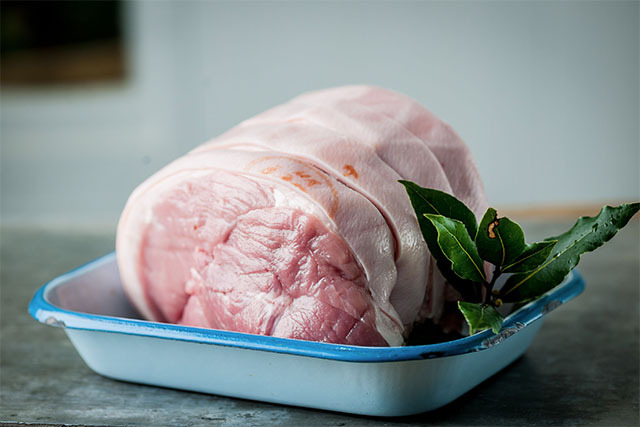 Etherington’s Butchery Academy is Cornwall’s first bespoke butchery school offering hands on courses in beef, lamb and pork butchery as well as sausage making. I attended the sausage making course which was both informative and entertaining. Under the expert guidance of Frank, we started with a huge chunk of pork and learnt to butcher it before creating strings of tasty, if a little wonky, sausages. The Academy is open to everyone and the courses are proving very popular with farmers, smallholders and foodies alike. Currently all planned sausage making courses are fully booked, but The Academy is very happy to put on extra dates; phone 01209 899203 to discuss your requirements. Gavin Roberts of The Kernow Sausage Company runs the Pig in a Day course at Philleigh Way Cookery School, described as a “culinary snout to tail journey”. 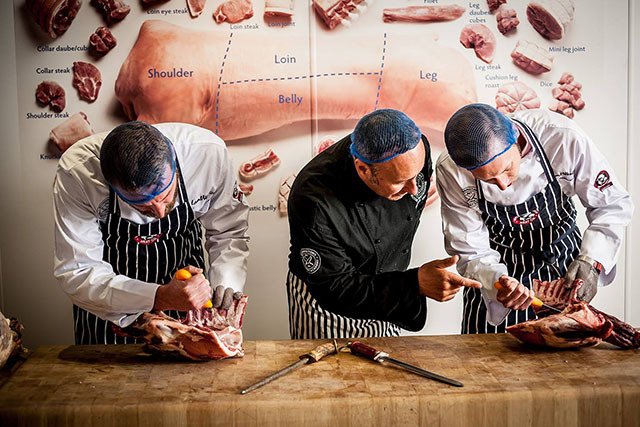 After an introduction to pork butchery and a butcher’s knife skills demonstration, Gavin will lead a masterclass in how to break down half a pig into various cuts and explaining the uses of each. Students also get to make their own sausages, including designing their own sausage recipe from the various herbs and spices on offer, and cure a piece of pork belly to take home. The next courses will be held on 11 March and 7 October, 10am to 4pm, and are priced at £145 per person including refreshments, brunch and lunch. 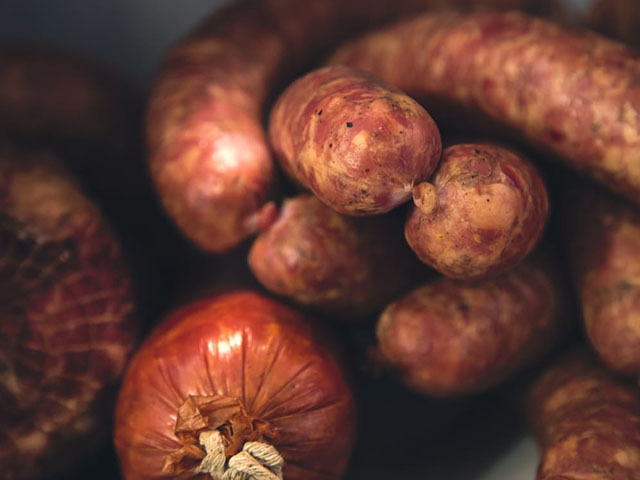 In the beginners’ sausage making courses at Hunstile Organic Farm students will learn to make their own sausages from scratch, trying different combinations of ingredients to create the perfect flavour. The next courses run on 19 and 26 February, and 8 April, from 11am to 4pm, and are priced at £55 per person including all ingredients and a farmhouse lunch. Bed and breakfast accommodation is also available, with a 20% discount for those participating in a workshop. Visit website for more details. Empire Farm runs a huge selection of butchery, charcuterie and smallholder courses. The three hour introductory sausage making course offers students plenty of hands on experience making traditional sausages, including stuffing and linking, as well as other options such as chorizo and gluten free sausages. The workshops, for up to 6 people, take place in the evenings. The next evening courses take place on 31 March, 28 April and 19 May, priced at £40 per person, including ingredients and refreshments, book online. These courses are hugely comprehensive, with both one and two days pig butchery and pig processing courses. On the one day processing course, students will turn every scrap into something tasty – sausages, chorizo, bacon, ham, gammon, terrine, faggots, pork pie and black pudding. £120 per person. The one day butchery and processing course is priced at £285, which includes half a pig, butchered during the day, plus sausages and bacon. For full details visit www.hiddenvalleypigs.co.uk.